Over the past couple of years, Twitter is the only social networking website which is dominating the whole internet on his head. This doesn’t mean that there aren’t any competitors because Facebook, Google Plus and Pinterest are the true Pioneers but Twitter has its own class and standards. Therefore, Pro Bloggers advice the new ones that they should start building their audience on twitter so they can take benefit from them. Achieving more than two thousand real Twitter followers is something that could give an enormous boost to the abilities of a blogger. After creating an account on Twitter, we can easily link it on our Website, so any person who approaches our website from Search engine or any other source can turn into our permanent follower. However, to attract as many followers to our Twitter account we can take advantage of a splendid widget that will magnetize your visitors and they would love to click it over and over again. 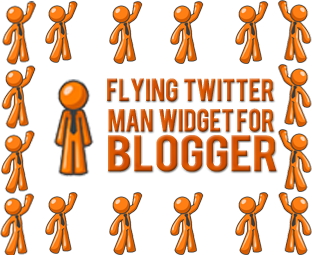 In this article, we will add a Cute Animated Flying Twitter Man Widget in Blogger. How does the Flying Twitter Man look like? Just look at the following screenshot, where you can see a man that is standing near to the site navigations. Whenever some will hover over it, a text will slowly glow i.e. Follow Me. This Animated Twitter Man will follow you on each and every nook and corner of your site. Fundamentally, this Flying man tries to follow the cursor when someone either scrolls up or down the page. Even though, we have said in the title that it is for Blogger but the concept of This Flying man can be utilized on any website that accepts HTML and Jquery. The steps are extremely straightforward, and it would hardly take 1 minute to complete the integration. Now Just Paste the Following Code there. Replace MYBLOGGERLAB with your twitter username and save your widget by pressing Save Button. ALL Done: Now go ahead and check your site and you will witness a picture perfect Twitter Man that will surly follow you throughout the blog. This widget would surely force your readers to follow you because it has such charisma that would attract them. In the next version, we will create a similar widget with RSS Feeds so users can easily multiple their subscribers. Unlike previous weeks, we are unable to update MBL Blog on daily basis that’s because we giving most of our time in creating widgets and themes for Blogger so our visitors can take benefits from them. In the coming days, we will be posting on daily basis and would try to at least publish 1 article per day. Your feedback and complains are most welcome till then peace, blessings and happy twitting. We have found the different thing in your blog. A Twitter man instead of Twitter bird. Thank you for this info. Animated Twitter Bird for WordPress.